In a bustling village of spirits, Yuzu, a cheerful fox girl, starts her first job as an attendant at the traditional hot springs inn Konohanatei. Though Yuzu has no experience working at such a high-class establishment, Kiri, the affable and reliable head attendant, immediately puts her to work learning the basics. While Yuzu's eagerness initially proves to be more of a hindrance than a blessing, her playful nature brings a unique charm to the inn, as both customers and her fellow workers quickly warm up to her clumsy yet well-meaning mistakes. Under the guidance of the other foxes the rigid Satsuki, the carefree Natsume, the critical Ren, and the quiet Sakura Yuzu steadily learns the trade of an inn attendant while learning to love the magical world surrounding her. 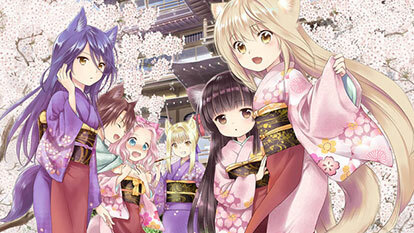 Konohana Kitan presents the heartwarming tale of a simple fox girl forging bonds with others and finding a home amidst the mysterious, beautiful world of spirits.